Reports on the Fears of the new Cyber Crime Law goes on international media | iStoryang HaaayTek! 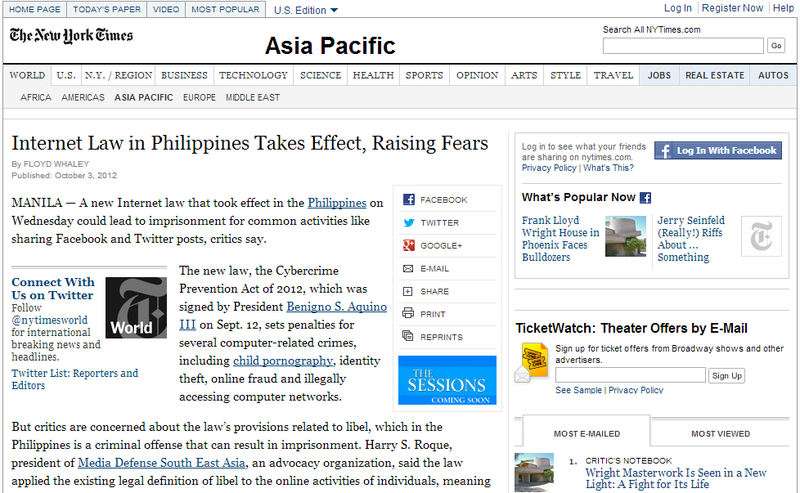 The New York Times, on its Asia-Pacific page, publishes today a story about the raised fears on the new internet law in the Philippines–the Cyber Crime Prevention Act of 2012 (RA 10175). The story is by line by Floyd Whaley dated October 3, 2012 (Oct. 4 in Phil). The report repeat the news reports circulating in the Philippines about the new cyber crime law and an interview with Atty. Harry Roque of the Media Defense South East Asia. Click the link to read the full article.